Hey guys! 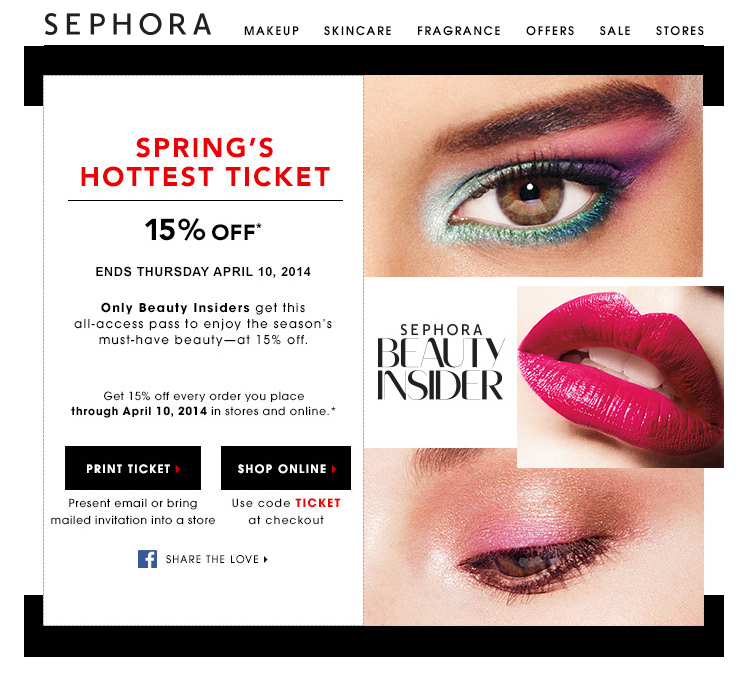 For all you beauty product junkies, it's time for the annual spring coupon at Sephora for 15% off your entire order. The sale is going on right now (code TICKET through April 10, 2014) so I wanted to give you guys a rundown of my top recommendations so you can fully take advantage of the discount. As I said before this 15% off sale is going on now through April 10, 2014 using code TICKET for Beauty Insiders, VIBTICKET for VIB members, and ROUGETICKET for VIB Rouge members. You can find my previous swatches and reviews here. If there's anything specific you'd like to ask about or think I'm missing let me know down below! Happy shopping! Readers, what are you picking up during this sale? What are your top Sephora recommendations? Share the love and let me know in the comments! that tropi coral set looks divine! If the Too Faced A La Mode gets onto Sephora's website during the sale, I will pick that up, otherwise, I'm sticking to my spending ban until my birthday in July. I'm dying to pick up a prettt bold red lipstick with blue undertones for my pale skin just have to find the perfect one! Great recommendations though. I did pick up the Too Faced lipstick in Marshmellow Bunny I think its called and was disappointed a little when I tried it on because I thought it would have been a little brighter. If you want a red from Too Faced, definitely try out Stiletto Red! It's gorgeous! Ardency Inn makes a gorgeous blue toned red. Hi Jen! I bought the hourglass ambient powder and the hourglass primer! have you tried those products before? I definitely took advantage of this today and got two birthday presents! :) I love when they do their seasonal sales! Hi Jen, what's the color you use for tarte under eye concealer? For Tarte Maracuja Creaseless Concealer I can use both Light-Medium (slightly brightening) or Medium (matches my skintone) for my undereyes. For comparison, I also use MUFE Full Cover Concealer in shade 7 and am on the light end of MAC NC30. I can't see your list! It won't load. ah i love all of your picks! I got the email about the sale today and I want to but things! I will probably get a DiorShow Blackout Mascara and I am thinking about the Naked2 palette, since I already have the Naked3 and love it! Jen! We can't use your referral links if we can't see them :P I can't see the list, I'm using Firefox 28.0, but I think it didn't work on the previous version either. Jen, would you recommend the Tarte concealer for under eyes over the Bobbi Brown one? Hey Jen! Do you use the Skinny Liquid Eyeliner or the Eye Do Liquid Eyeliner both from Eyeko? Are they both really waterproof? Thanks! Yup! They both have the same formula (yes it's waterproof) but the Eye Do has a bit skinnier pen tip. Not as fine as the Stila or Urban Decay one though! Thanks Jen! I really loved your mascara 101 video! My eyelashes grow straight down, and sometimes poke me in the eye! Thank-you for your help! I have very oily skin. I use Medium beige for Bare mineral foundation. It looks yellow on me... Do you have any recommendation for long wearing foundation and primer for oily skin? Also, I have dark brown hair. Which color i should pick for shu uemura hard formula brow pencil? It has seal brown, brown and grey, I believe. Thank you in advance. If you pick up the Hourglass Primer I listed above, it will seriously help ANY liquid foundation last much longer. I really loved it paired with my Neutrogena Healthy Skin Foundation which is the only drugstore foundation I've loved. I use shade 60 Natural Beige and if you blot right after applying powder, it should be good for oily skin too. For eyebrow pencil, go for a brown-grey shade!